(a) Apply a light coat of gasoline or spindle oil to new O-rings, and then install one onto each fuel injector assembly. (b) Apply a light coat of gasoline or spindle oil to the contact surfaces of the new O-ring on each fuel injector assembly. (c) While turning the fuel injector assembly left and right, install it onto the fuel delivery pipe sub-assembly. 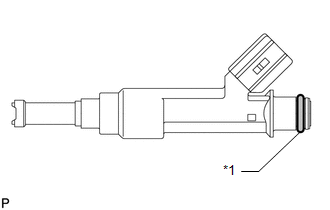 Make sure that the O-ring is not cracked or jammed when installing the injector (See page ). (d) Check that the fuel injector rotates smoothly. 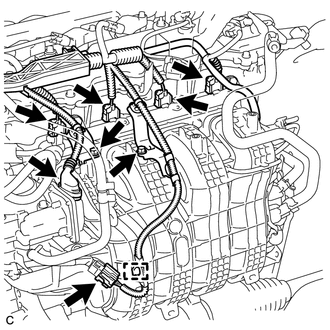 If the fuel injector does not rotate, replace the O-ring. (a) Install 4 new injector vibration insulators to the cylinder head. (b) Install the 2 fuel delivery spacers onto the cylinder head. Install the fuel delivery spacer so that the longer protrusion is on the cylinder head side. (c) Install the fuel delivery pipe sub-assembly together with the 4 fuel injectors to the cylinder head, and then temporarily install the 2 bolts. Be careful not to drop the fuel injectors when installing the fuel delivery pipe sub-assembly. 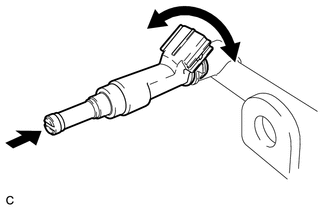 (d) Tighten the 2 bolts to the specified torque. 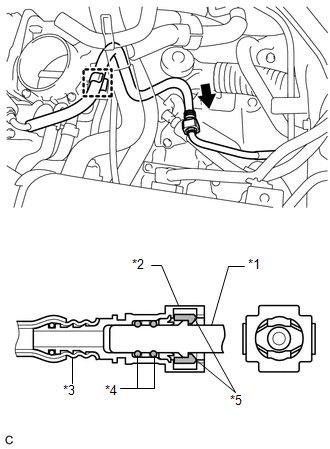 Do not drop the fuel injectors when installing the fuel delivery pipe sub-assembly. Check that the fuel injector assemblies rotate smoothly after installing the fuel delivery pipe sub-assembly. (a) Install the 2 wire harness brackets with the 2 bolts. 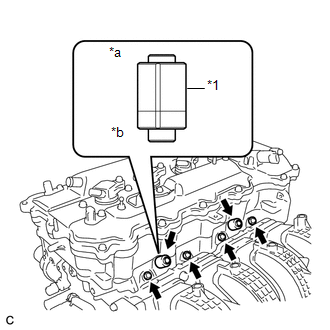 (c) Connect the 4 fuel injector connectors. (d) Engage the clamp to connect the wire harness. (a) Push the fuel tube connector to the fuel pipe until the fuel tube connector makes a "click" sound. Before connecting the fuel tube connector and fuel pipe, check that there is no damage or foreign matter on the connecting part of the fuel pipe. (b) Install the No. 1 fuel pipe clamp. (c) Install the fuel tube sub-assembly to the fuel hose clamp.